Here at Ada & Ina, we’ve spent over a decade testing our products and putting them to use in our everyday lives, in order to develop and provide proper care instructions for our customers. Below are some basic guidelines to help keep your linen bedding looking beautiful for years to come. However, please remember to always check the product label as care instructions may vary between items, based on the unique construction of each fabric. It’s a common misconception that linen is difficult to care for, or that it is “dry-clean only.” In actual fact, linen is super easy to clean and best NOT to dry-clean it. Made from the cellulose fibres that grow inside the flax plant (or Linum usitatissimum), linen has been cultivated and used as a textile for thousands of years. Being such a natural, simple fabric, caring for it is simple too. Linen actually becomes softer and more absorbent after each wash, which is one of the reasons we love it so much. Although simple to care for, there are a few things to know about washing your linen products that differ slightly from how you would wash other similar, natural fabrics like cotton. As mentioned above, there is no need to bring your linen bedding to the dry-cleaners. Unlike more structured, tailored linen items such as suits and blazers, the majority of linen products can absolutely be machine washed and of course, hand washed if you so desire. Always wash your linen bedding on your machine’s gentle cycle to help protect it’s beautiful, natural fibre. If it’s possible to select the water level in your washing machine, always use the maximum offered. Your bedding should be able to move around freely in the machine. On the same note, try not to overcrowd the washing machine with too many items at once. This can cause the fabric to lose it’s shape. As with all laundry, make sure that any other items in the washing machine are similar in terms of color, weight and washing instructions — i.e. lightweight cottons, undergarments and other delicates would be suitable to wash alongside your linen sheets. Avoid washing your linens alongside heavy items, such as jeans or towels. Always wash your linen bedding in lukewarm water. Ada & Ina recommend a temperature of 40 degrees, as we’ve found this to be the most effective setting to remove dirt and natural body oils, as well as any leftover chemical residue from the detergent used. Detergent residue can deteriorate the fabric fibre if it is not rinsed out properly. Linen is best washed with a mild detergent that is formulated for delicate fabrics, and free from optical brightening agents (chemicals which are very commonly used in detergents to enhance fabric colors). OBA’s are great for keeping whites white, but can also weaken and discolor certain fabric fibres. 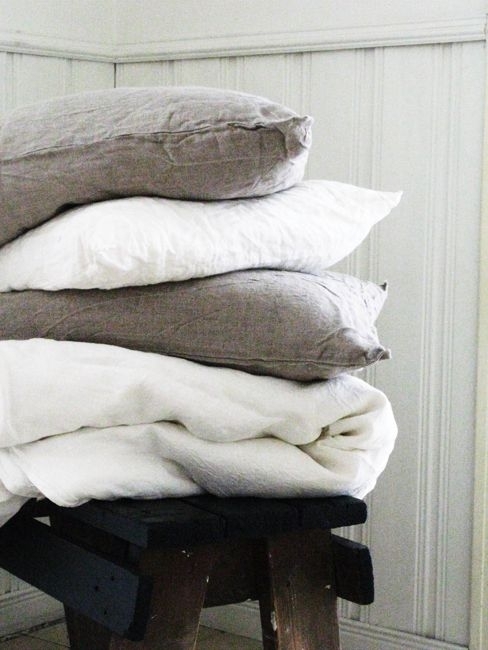 To compliment your all natural linen bedding, Ada & Ina recommend washing sheets with an all natural laundry detergent! One of our favorites is a eucalyptus based detergent called “Woolwash.” Alternatively, linen can be washed with detergents designed for baby clothes. Try a scent- and dye-free option like “Ecover Laundry Liquid”. Make sure to wait until the detergent is fully diluted in the water before placing bedding into the washing machine. Undiluted detergents can cause staining. Fabric softener is not required or recommended to be used on our linen products. Linen is a beautiful, natural fabric which softens dramatically over time. So ditch the man-made fabric softener and let nature do it’s thing. Hand washing your linen bedding is definitely acceptable, but probably best to use this method when the fabric is not heavily soiled (for heavily soiled items, stick to the washing machine). It could also be a good idea to hand wash when the linen has a loose weave, so as to avoid any potential for the fabric to pull. If you choose to hand wash your linen bedding, the same general rules apply as when you’re washing them in the machine: be sure to hand wash the linen in lukewarm water, using only mild detergent, and ensuring that all detergent is completely rinsed from the linen before drying. Place the linen in a clean sink or basin, with the mild/all natural detergent and lukewarm water. Use a gentle swishing motion with your hands, agitating the linen in the water for a minute or two. Never wring, twist or scrub the fabric. Instead, remove the linens from the sink once you’ve given them a thorough swirl, drain the soapy water, rinse the sink, and refill with lukewarm water. Rinse the linens and repeat until the water is soap free. When it comes to drying your linen sheets, air drying is best for longevity, although it can sometimes leave the linen feeling a bit stiff. For this reason, we recommend a combination of air and machine drying. First, put the bedding in the dryer for about 10 minutes, on low to medium heat. Keep in mind that drying items in smaller loads will allow for a more even drying of your sheets, so you might want to dry them in batches. Note: linen dries much faster than cotton so be cautious as to not over dry your sheets, as this will weaken their natural fibres and potentially cause them to deteriorate. Remove the sheets from the dryer while they are still slightly damp. Hang or spread them out somewhere flat, to finish off the drying process (be careful if hanging to dry, as clothes pins could leave unwanted creases in the fabric). Gravity will do the work of eliminating nearly all wrinkles. Do I need to Iron Linen Bedding? There is no need to iron linen garments. In fact, we love the inherent natural creases that give linen its drapey, relaxed, soft feel. However, if your bedding has become too wrinkly for your liking, feel free to iron, but do so while the fabric is still damp. Use a medium-hot iron on the steam setting. Lighter colored linens may be ironed on both sides, while darker linens should only be pressed only on the reverse side. Whenever possible, we recommend cleaning stains as soon as they develop. Try sprinkling baking soda on the stain and then adding a few drops of vinegar. Blot (do not scrub) the stain with a paper towel to soak up the moisture, and repeat the process as necessary. Although it is easier to remove stains from a natural linen product as opposed to a synthetic fabric, once a stain has truly set in, it is often difficult to remove. Follow these simple guidelines in order to prolong the life of your new Ada & Ina linen products!